August 29, 2006, Washington, D.C. The communication gap between military families at Fort Drum, N.Y., and their soon-to-be deployed servicemembers was bridged before it existed, thanks to Operation Homelink. Operation Homelink is a member of the Defense Department's America Supports You program, which spotlights ways the American people and the nation's corporate sector support U.S. servicemembers. The Chicago-based, nonprofit's president and founder, Dan Shannon, was on hand Aug. 23 to help distribute 100 refurbished computers to families at Fort Drum. CDW Government Inc. donated the computers, Shannon said. CDW Government, Inc., is a leading source of information technology solutions to governments, according to a news release. The computers will provide the families, whose servicemembers are preparing to deploy with the Army's 2nd Brigade Combat Team, 10th Mountain Division, the means to maintain e-mail contact with their loved one during the deployment, Shannon said. “I can't think of a better place for us to have taken those computers,” Shannon said, explaining that officials at Fort Drum told him most of the servicemembers stationed there are currently deployed. 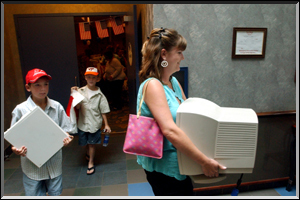 Lisa Wrenn, with help from sons, Kasey, 11, (center), and Kody, 8, carries a computer donated by Operation Homelink on Aug. 23 at Fort Drum, N.Y. Wrenn's husband, Army Spec. William Wrenn, recently deployed with the 2nd Brigade Combat Team, 10th Mountain Division. Courtesy photo. Lisa Wrenn, whose husband, Spec. William Wrenn, with the 2nd Brigade, 10th Mountain Division, was especially appreciative. For some young spouses that deployment is a first. One young woman in particular, made an impression on Shannon, he said. Despite the joy the computers brought the recipients, it was an emotional day. “They recently lost some soldiers there,” Shannon said. Fort Drum families are not the first beneficiaries of Operation Homelink's efforts, Shannon said. 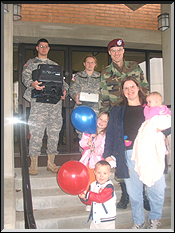 Since its inception, the organization has provided 1,500 military families with refurbished computers and the means to communicate with loved ones. This is made possible through corporation's bulk donations of qualified used computers. 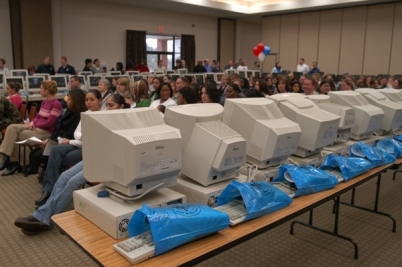 Each donation must consist of at least 100 desktop or 10 laptop computers with these minimum technology specifications: Pentium III desktops with an 850 MHz processor or Pentium III laptops with a 500 MHz processor, Shannon said. 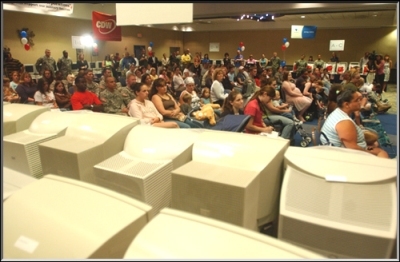 No further monetary donation is required, and the donor can specify which military facility will receive the computers. Often corporations donate practically new equipment, he said. When that's the case, Homelink sells those computers and uses the proceeds to purchase refurbished computers, which fulfill Homelink's goal of providing a means of communication. When the donated computers aren't so new, they are simply refurbished to ensure all existing information is wiped from the hard drives. They're then tested and reloaded with a new operating system and modem and shipped to the designated unit, Shannon said. As much as Homelink would like to entertain individual requests it's not economically feasible, he added. “The economics are such that it's four times more expensive to send out a boxed individual computer than it is to send them as we did to Fort Drum, in bulk” Shannon said. “We also aren't able to accept individual computers from donors, as much as we'd like to. “We need to work in mass quantities for the economy … and efficiency of the process,” he said. That process will allow Homelink to provide computers to families at Fort Carson, Colo., soon, Shannon said. “Then we're working on getting some computers to Fort Hood (Texas) and Camp Lejeune (N.C.) later this year,” he added. The next step is finding an Internet service provider to donate Internet connections for these families, Shannon said. Though he realizes there are companies that provide a certain number of hours of Internet connection at no cost, families are responsible for the charges above and beyond those few hours. “It's something I've been working on, but we haven't made the right connections with the right organization,” he said. “We'd love to have somebody … step up and provide free Internet service for the first deployment, for the 12-month period. “It seems logical to me that those (families) would be loyal customers for the rest of their lives,” he said. Operation Homelink (OHL) announced today that the Fisher House Foundation has selected OHL to receive a 2006 “Newman’s Own Award” with a $5,000 grant for their innovative program “Operation Laptop”. OHL was one of 12 organizations receiving the award at a presentation at the Pentagon on August 11, 2006. General Peter Pace, the nation’s senior military leader and Chairman, Joint Chiefs of Staff, assisted in the presentation. Newman’s Own, Fisher House Foundation, and Military Times Media Group jointly sponsored the award which seeks to reward ingenuity and innovation for volunteer organizations working to improve military quality of life. OHL is a non-profit organization that provides American service members and their families with refurbished computers to help improve email communication. OHL’s “Operation Laptop” program provides refurbished wireless laptops to military medical centers across the United States. Families of Fort Campbell Soldiers will be just a few clicks away from their loved ones overseas after a partnership with Dell Computers and Operation Homelink donated refurbished desktop computers to military families. More than 100 Dell computers were presented to families of junior enlisted Soldiers to enable them to keep in touch with deployed Soldiers Jan. 5 at the Family Resource Center. Operation Homelink is a non-profit organization providing refurbished computers at no cost to families of junior enlisted Soldiers. 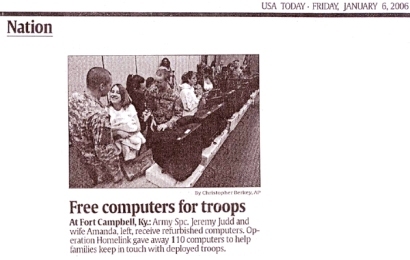 This is Dell’s third time to partner with Operation Homelink by donating computers in support of the troops. Each family had to meet certain specifications to receive the free Dell computer, said Family Readiness Group site coordinator Jo Dempsey. “We split the computers equally amongst the whole division,” Dempsey said. “Each brigade got 10 computers, and then it was up to the rear detachment commander and the Family Readiness Group leaders to identify those families that fit the specifications. Soldiers must be sergeant or below, be deployed and have no computer at home, because what we are attempting to do is allow Soldiers to now have a way to communicate with their spouse by e-mailing. During the wake of Sept. 11, president and founder of Operation Homelink Dan Shannon began his philanthropic efforts in helping military families. “A little over three years ago, there were more and more stories of units being called up to deploy to the Middle East,” Shannon said. Vice President of Dell’s Nashville Operations Frank Miller said it’s an honor for the Dell organization to be involved in an event supporting military families. Stacy Hunter, who husband is on his second-term deployment, said she is going to give her computer to her family in Louisiana who lost everything in Hurricane Katrina.